LIGHT TOP/HEAVY BOTTOM. 10-52. NICKEL ROUND WOUND SETS. The 'Wicked Range' are high quality strings for the electric guitar. 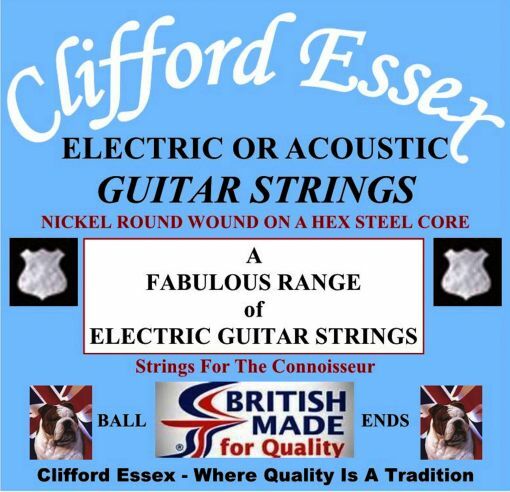 Made from the finest British steel, the 4th, 5th and 6th strings are nickel round wound on a hex steel core. In his book 'The Autobiography' Eric Clapton mentions our strings. STRINGS - ELECTRIC GUITAR - THE WICKED RANGE - NICKEL WOUND ON A HEX STEEL CORE. I put the 12s nickel strings onto my Highway 61 Dobro As I wanted to leave it in standard tuning. The tone worked for me and I would recommend for Electric, Acoustic or Dobro. SUPER LIGHT. 8-38. NICKEL ROUND WOUND SETS. EXTRA LIGHT. 9-42. NICKEL ROUND WOUND SETS. MEDIUM. 12-52. NICKEL ROUND WOUND SETS. SUPER ROCK. 11-48. NICKEL ROUND WOUND SETS. RITCHIE BLACKMORE. 10-48. NICKEL ROUND WOUND SETS. ULTRA LIGHT. 10-46. NICKEL ROUND WOUND SETS.